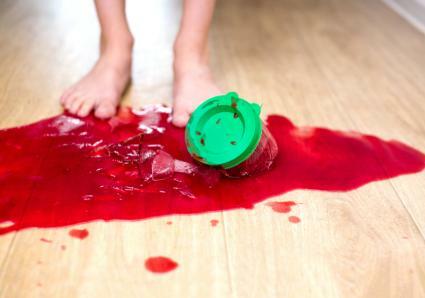 From scuff marks to food stains, vinyl floors are susceptible to several different kinds of stubborn stains. Learn how to get them up to help keep your vinyl floor in the best condition possible. Accidents happen, and learning a few tricks on how to remove stubborn stains from vinyl flooring will help extend the life of your floor and save a few headaches in the process. As a general recommendation if specific manufacturer's instructions are unavailable, clean soiled spots on vinyl floors with the mildest substances first and work up from there. Mix one part dishwashing liquid with 10 parts water. Apply the solution to the spot and rub with a sponge. Mix one tablespoon of ammonia with one quart warm water. Pour a small amount of the ammonia mixture onto the spot and leave undisturbed for 10 minutes. Gently agitate the ammonia with a soft-bristled brush. If the stain remains, increase the ratio of ammonia to water by half and repeat. Black heel and furniture scuff marks are one of the most common stains that mar vinyl floors. They typically resist most normal cleaning solutions, but come right up with the right product. Soak a soft cloth in denatured alcohol or lighter fluid. Rub the cloth onto the scuff mark, pressing down firmly into the floor. Foods like fruit juice, wine or tomato sauce can often leave behind stubborn stains on a vinyl floor that can be difficult to remove. If you're patient, however, you can get them up with very little effort and just a little time. Mix together one part bleach to four parts water. Soak a rag or cloth in the solution and place the soaked cloth on top of the stain. Leave the cloth in place undisturbed for one hour to let the bleach soak into the stain and lighten it. Rinse the stain well with water and dry. Do not use bleach on rust stains, as this may cause the stain to oxidize and discolor the floor. Never use undiluted bleach on the floor, as this could discolor the vinyl as well. Test all cleaners or chemicals in an inconspicuous area like a closet to ensure that the cleaner will not discolor or harm the floor. Use white cloths to avoid color bleed when the cloth comes in contact with the cleaning solution. Ventilate the area well and keep any rags soaked in alcohol or lighter fluid away from pilot lights or open flames when cleaning the floor. Avoid abrasive cleaners as these can strip the finish off the vinyl and leave a permanent mark. Wipe up spills and clean stains as soon as they are noticed to avoid having them set in deeper. With proper care and cleaning, a vinyl floor can last for decades. Remove even the most stubborn stains from your vinyl as soon as you notice them to help keep your floor in the best possible condition.